Fundamental for a trip abroad is a valid passport. A passport is a document that proves your identity and citizenship. You will not be able to cross a border or board a plane without one. 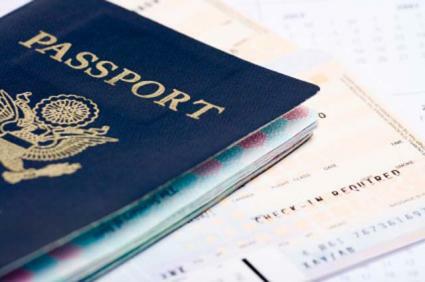 United States citizens can pick up a passport application at local post offices. You can also find an application at the U.S. State Department site. After completing the application, you'll need to include regulation size passport photos. Be sure to allow enough time for processing, as it can take up to six weeks for passports to be issued. Some countries require a visitor to obtain a visa before entering. The visitor must complete a visa application and submit it to the government of the destination country. For United States citizens, a visa may be obtained through the embassy or consulate of the destination country. The embassy or consulate is located in the United States. You'll need to submit your passport with the visa application, as the visa will be stamped in your passport. Again, you'll need to allow plenty of processing time before you depart. You want to be prepared for Customs when you re-enter the United States. If you are traveling with expensive items, such as jewelry or cameras, that were purchased in the United State but are also sold overseas, include documentation to show that they were purchased here. Providing this documentation to the Customs officials will save you time and trouble after a long flight. A purchase receipt or insurance policy will prove the item was purchased prior to your departure from the United States. If you are traveling with prescription medications, it's a good idea to carry the doctor's prescription with you. This is also helpful when going through Customs upon re-entering the United States. You may also need an emergency refill of your medication. Having a written prescription on hand when you travel will save you time. Be aware, however, that prescription drug brand names are different overseas, though the generic version is the same. You may want to ask your doctor for a generic drug prescription to avoid confusion at a foreign pharmacy. Some personal things provide so much comfort that they are necessary items in traveling abroad. You'll want to make sure they are included in your suitcase and you'll be able to use them while you're away from home. Many overseas destinations use a different voltage of electricity than the United States. Common electronics and appliances you bring on your trip may not work on foreign voltage and plugs. If you plan to take a blow dryer, laptop, cell phone or other electronic device, you will need a converter to adapt to the plug and voltage. For some electronic gadgets, you will also want to include a small transformer in you luggage. The transformer will carry a larger load and prevent your electronic device from overheating. You may be tempted to leave your debit card at home, but think again. With a debit card, you can draw funds in foreign currency immediately upon arrival overseas no matter the time of day. You won't have to wait for banks or exchangers to open. Foreign ATMs also offer excellent exchange rates. Many times the machines offer faster service than a bank or currency exchanger. The fees are higher, but the withdrawal limits are also higher. You should be aware that pseudoephedrine, which is in many cold medications, is strictly controlled in some countries. Consequently, you may not be able to buy your favorite cold remedy overseas, so it is better to take it with you. You want your trip to be smooth and comfortable. A few basic necessities can make your trip more pleasant and your return a breeze. Bon Voyage!